Why Are We Going to Pluto? The artist's conception at the top of this page, of the New Horizons spacecraft passing over Pluto with the moon Charon behind and the bright Sun in the far distance, is courtesy of Johns Hopkins University Applied Physics Laboratory / Southwest Research Institute. Pluto is is a small, cold, dark, frozen, rugged, uneven, craggy place. It seems to be composed mostly of rock and ice with a thin atmosphere of nitrogen, carbon monoxide and methane. Discovered in 1930, Pluto's origin is unknown. It's one of the most mysterious objects in our Solar System because it's the farthest planet and we know the least about it. The bizarre world boasts an eccentric orbit, seasonal atmosphere and mysterious ice moon. The tiny planet is estimated to be 1,440 miles in diameter. That's 70 percent as big as Earth's Moon. Faraway enigma. Pluto is 39 times farther from the Sun than Earth is. Its average distance from the Sun is 3.67 billion miles. A year for Pluto — one revolution around the Sun — is equivalent to 248 Earth years. It takes Pluto 6 Earth days 9 hours to rotate one time. Squashed loop. The planet is in a strange orbit that is off-center in relation to the Sun and tilts up from the Solar System plane. Scientists say that eccentric orbit resembles a squashed circle. The unusual path around the Sun sometimes brings Pluto closer to the Sun than the planet Neptune. In other words, the orbit leads Pluto to cross planet Neptune's path. It is the only major planet to cross another planet's orbit. Recent crossing. From 1979 to 1999, Pluto was the eighth planet from the Sun. In 1999, it crossed Neptune's path to again become the Solar System's most distant planet. It will remain in that ninth planet position for more than 200 years before crossing inside Neptune's orbit again. Pluto and Netpune never will collide because their orbits are very different. Pluto can be visualized as above Neptune in the orbital plane. The two planets always are separated by more than a billion miles. Reason to go there. Today, Pluto is moving farther away, which eventually will lead its thin atmosphere to freeze and fall to the planet's surface. Once frozen, that surface probably won't thaw until around 2230 as it swings back closer to the Sun. That's why thje unmanned interplanetary probe New Horizons has been sent to Pluto. Shrouded mystery. Pluto's great distance from Earth has kept the planet shrouded in mystery since its discovery. It is the only major planet in our Solar System not yet viewed close-up by a spacecraft from Earth. Given the planet's great distance and tiny size, studying it continues to challenge and extend the skills of planetary astronomers. Most of the little we know about Pluto has been learned since the late 1970s. Many of the key questions about the planet and its natural satellites await the close-up observation of the unmanned robot-probe spaceflight mission, New Horizons. New moons discovered. Astronomers using the Hubble Space Telescope in 2005 spotted two new moons orbiting Pluto. Ice Dwarfs. Beyond Pluto lies the recently-discovered Kuiper Belt of minor planets known as "ice dwarfs." Its history may be connected with the planet Pluto and even with the Earth's atmosphere and biosphere. If NASA's New Horizons reconnaissance encounter with Pluto is successful, the spacecraft then will fly on to pass by one or more of the icy asteroid-sized objects in the Kuiper Belt. Time considerations for exploring Pluto. The 2006 New Horizons blastoff from Earth is the last launch opportunity for more than a decade that would allow the probe to use the gravity of Jupiter to boost itself to Pluto. Time is running out for those astronomers who are alive today to study the planet. Pluto travels a highly irregular orbit around the Sun and currently is rushing away from our star. That makes the trip for a robot explorer lengthier and more expensive. If the project had been delayed, today's scientists wouldn't get another chance in their lifetimes; nor would their grandchildren for more than 200 years. Locked in a Deep Freeze. As snow covers up important aspects of Pluto's surface, opportunity for planetary scientists to study the atmosphere is reduced. They calculate the freezing process could take from a few years to a few decades. Afterward, the planet will stay locked in a deep freeze until the 23rd century, when its orbit will bring it back toward the Sun. The scientists also are running out of daylight. Pluto is at its equinox now and the Sun hits almost all parts of the planet as it rotates during a 153-hour-long Plutonian day. But Pluto is moving toward solstice where one hemisphere will be in shadow for decades. Every year, some 200,000 square kilometers are lost to view. For instance, if the exploration project had been delayed to arrive in 2030, it would have been able to see only half as much of Pluto. Robot Explorer, phone home! As the New Horizons spacecraft flies away from Earth, NASA's Deep Space Network and other ground operations have to operate over many years monitoring the spacecraft. 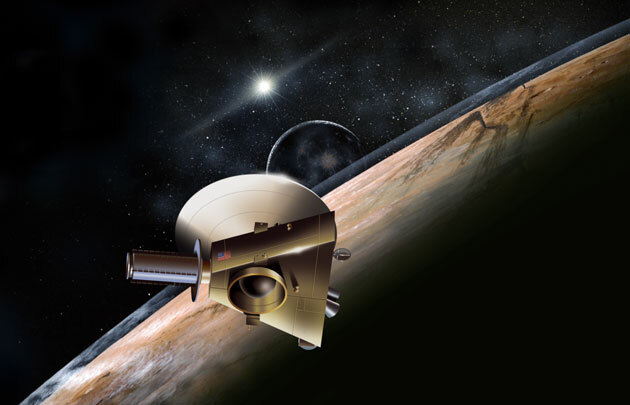 Once the robot probe is out there at Pluto and beyond — more than three billion miles away from Earth — a radio signal will take more than four hours to reach back to Earth. The probe will report back on atmospheres, temperatures and surface features of Pluto and its moons, then travel on out of the Solar System for a close look at primordial comets in the distant Kuiper Belt, which probably holds clues about how the Solar System formed. Exploring the Kuiper Belt would be like a deep space archeological dig into the early history of our Solar System, according to NASA.